Kate Khair – hailed at last week’s EAHAD meeting as the most famous haemophilia nurse in the world – will leave her consultant nurse post at London’s Great Ormond Street Hospital (GOSH) in May 2018. But she will still remain very active in the world of haemophilia. Played a pivotal role in the development of the haemophilia nurse role through her leadership of the UK Haemophilia Nurses Association and the nurses committee of WFH. Received a PhD, for her pioneering research into the lived experience of children and adolescents with haemophilia. 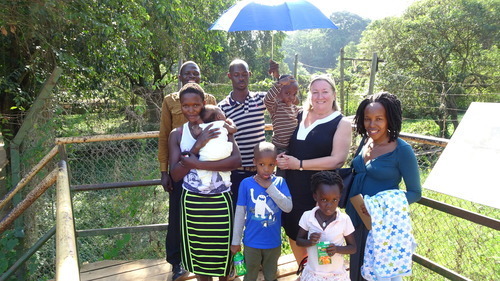 Played an active role in the World Federation of Hemophilia outreach programmes, supporting the development of haemophilia care in countries like Uganda (see picture above). Launched The Journal of Haemophilia Practice, an open-access journal for all professionals to share their experience of caring for people with bleeding disorders. Haemnet provides education, undertakes research and drives service innovation. It is best known for running the annual HNA meetings, and the Contemporary Care of People with Bleeding Disorders residential training course. But in the past two years 14 allied care professionals have been through the Haemnet ASPIRE leadership development programme, designed to help nurses, physios, psychologists and social workers all find their voice within the multidisciplinary care teams. The hope is that they will all follow Kate and lead service change to the benefit of patients.